Former Pakistan President Musharraf has been on a media blitz of sorts seeking love and money from the new Obama Aministration. Musharraf got rich off Bush-Cheney. Now President Zardari is at it; seeking U.S. approval and funding which may be in serious doubt. Just yesterday Defense Secretary Gates said Predator drones would continue to invade pakistan’s air space in efforts to find and kill terrorists the Pakistani’s tolerate. On Sunday, September 10, 2006, the late Tim Russet hosted Vice President Cheney on”Meet the Press.” Cheney made an extremely long supporting speech on the importance of General Musharraf and pakistan to the United States. I heard about this while in Pakistan working near my friend Muhammad. Muhammad is now dead, killed by the Taliban, right near where the Predator drones are operating today. Musharraf is no longer the kingpin in Pakistan. But it was Tim Russert’s careful, probing inquiry with Cheney that opened my eyes to the growing troubles between the U.S. and Pakistan — and the kind of “over the top” support once given to Pakistan by the United States. 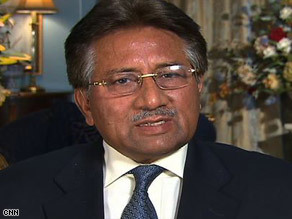 “President Musharraf has been a great ally. There was, prior to 9/11, a close relationship between the Pakistan intelligence services and the Taliban. Pakistan was one of only three nations that recognized, diplomatically recognized the government of Afghanistan at that particular time. But the fact is Musharraf has put his neck on the line in order to be effective in going after the extremist elements including al-Qaeda and including the Taliban in Pakistan. There have been three attempts on his life, two of those by al-Qaeda over the course of the last three years. This is a man who has demonstrated great courage under very difficult political circumstances and has been a great ally for the United States”. Pakistan looks forward to a new beginning in its bilateral relationship with the United States. First, we congratulate Barack Obama and the country that had the character to elect him, and we welcome his decision to name a special envoy to Southwest Asia. Appointing the seasoned diplomat Richard Holbrooke says much about the president’s worldview and his understanding of the complexities of peace and stability and the threats of extremism and terrorism. Simply put, we must move beyond rhetoric and tackle the hard problems. Pakistan has repeatedly been identified as the most critical external problem facing the new administration. The situation in Pakistan, Afghanistan and India is indeed critical, but its severity actually presents an opportunity for aggressive and innovative action. Since the end of the Musharraf dictatorship, Pakistan has worked to confront the challenges of a young democracy facing an active insurgency, within the context of an international economic crisis. Ambassador Holbrooke will soon discover that Pakistan is far more than a rhetorical partner in the fight against extremism. Unlike in the 1980s, we are surrogates for no one. With all due respect, we need no lectures on our commitment. This is our war. It is our children and wives who are dying. The youthful looking Mr. Milliband became the laughingstock of the British media last autumn when he carried a banana into a meeting. He also criticized President George W. Bush this last week. And who didn’t? “He’s a Brit and he should keep his damn opinion over there,” one Texan said….. Upset at Britain’s attempt to link the Kashmir issue to terrorism, India on Thursday said it does not share London’s views and does not need “unsolicited advice” on its internal issues. 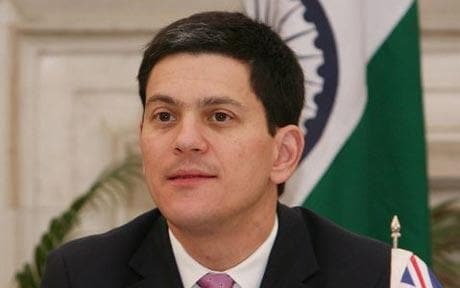 “Mr (David) Miliband is entitled to his views, which are clearly his own and are evolving,” External Affairs Ministry spokesman Vishnu Prakash told reporters while commenting on the remarks by the British Foreign Secretary which sought to link non-resolution of Kashmir issue to terrorism in India. “We do not need unsolicited advice on the internal issues of India like Jammu and Kashmir,” Prakash said. He was responding to Miliband’s remarks that the resolution of the longstanding issue between India and Pakistan would help deny extremists in the region “one of their main calls to arms”. “Although I understand the current difficulties, resolution of the dispute over Kashmir would help deny extremists in the region one of their main calls to arms, and allow Pakistani authorities to focus more effectively on tackling the threat on their western borders,” Miliband wrote in British newspaper The Guardian in an article published today. “India is a free country and even if we do not share his views, he is free to express them,” the MEA spokesman said. India has been maintaining that terrorism in this country should not be seen from the “prism” of Indo-Pak relations, as it was a manifestation of a global problem. New Delhi is also unhappy with Miliband’s support to Pakistan’s position that those wanted by India for terrorism need not be handed over but tried in Pakistan. Pakistan announced that it has arrested 71 members of Lashkar-e-Taiba and detained 124 more in an effort to crack down on the Islamic militant group believed to be responsible for November’s attacks on the Indian city of Mumbai. India’s foreign minister insisted that Pakistan must extradite the suspects for trial in India, backing down from his earlier statement that India might accept a trial in Pakistan. The Associated Press reports that the arrests come as part of Pakistan’s investigation into the attacks, which left 164 people dead and heightened tensions between the neighboring nuclear powers. India and Pakistan have fought three wars since 1947. Pakistan insisted it would help India to bring those behind the Mumbai terrorist attacks to justice, saying Thursday it had shut down extremist Web sites and suspected militant training camps, and detained 71 people in a deepening probe. Still, a top Pakistani official said authorities needed to further investigate information about the attacks provided by archrival India before it could be used to prosecute suspects in court. Days after the November attacks, the U.N. Security Council declared that Jamaat-ud-Dawa, a charity in Pakistan, was merely a front for the outlawed militant organization. Pakistan announced that Lashkar-e-Taiba founder Hafiz Mohammed Saeed and its “operations commander” Zakiur Rehman Lakhvi were among those detained by Islamabad, according to English-language newspaper Dawn in Pakistan. “We have arrested a total of 124 mid-level and top leaders of JuD in response to a UN resolution — 69 from Punjab, 21 from Sindh, eight from Balochistan and 25 from the NWFP — blocked …. Pakistan has arrested 71 people in a crackdown on groups allegedly linked to the Mumbai attacks, officials said Thursday, while adding that the information India has handed over needs work before it can be used as evidence in court. Still, Interior Ministry chief Rehman Malik dodged a question on whether he was conceding that the plot — which killed 164 people in India’s commercial capital and raised tension between the nuclear-armed rivals — was hatched on Pakistani soil. India says a Pakistan-based militant group, Lashkar-e-Taiba, masterminded the November attack. In the days afterward, the U.N. Security Council declared that Jamaat-ud-Dawa, a charity in Pakistan, was merely a front for the outlawed militant organization. On Thursday, the Interior Ministry said 71 leaders of the groups had been arrested since then — nearly a score more than previously announced. Another 124 have been placed under surveillance and must register their every move with police. Ministry chief Rehman Malik initially said that 124 people had been detained. But his deputy, Kamal Shah, later told The Associated Press that Malik had misspoken. Soon after President George Bush used the term “Axis of evil” to describe nations he thought were supporting terrorism, the phrase died because it offended so many. Now Britain’s Foreign Secretary is saying even the term “war on terror” was not useful….and may have done more harm than good. George W Bush’s “war on terror” may have played into the hands of violent extremists, David Miliband has warned. In what will be seen as an thinly-veiled attack on the outgoing US president George W Bush, the Foreign Secretary said that presenting the conflict as a battle of “good and evil” may have done more harm than good. His comments came as a senior Bush administration official admitted for the first time that a Guantanamo Bay detainee was tortured during questioning over links to the 9/11 attacks. Susan Crawford, who oversees the tribunals for terror suspects at the US base in Cuba, said she believed the interrogation of Saudi national Mohammed al-Qahtani amounted to torture. She said the frequency and the adverse effect of the torture on Qahtani’s mental and physical state persuaded her that military questioners had crossed the line from harsh interrogation to illegality. Mrs Crawford told the Washington Post she did not refer the case for prosecution as “his treatment met the legal definition of torture”. Ahead of a speech at one of the hotels at the centre of the Mumbai terror siege in India, Mr Miliband wrote in an article: “The more we lump terrorist groups together and draw the battle lines as a simple binary struggle between moderates and extremists or good and evil, the more we play into the hands of those seeking to unify groups with little in common. Pakistan said Friday that it has sent “feedback” and information to India about the Mumbai attacks, and Joe Biden came here to underscore how seriously the incoming U.S. administration takes the terror threat from South Asia. New Delhi recently said it gave Islamabad a dossier of evidence linking the Mumbai attacks to Pakistan, but it was unclear if Pakistan’s feedback related directly to that dossier. Gilani told reporters that the CIA had played an intermediary role and that Pakistan’s premier spy agency, the Inter-Services Intelligence, had reviewed the information from India. He gave few other details. India says Pakistani militants were behind the November attacks that killed 164 people in its financial hub. It specifically blames the banned group Lashkar-e-Taiba, which is believed to have links to the Pakistani intelligence agency. Pakistan acknowledged this week that of the 10 gunmen involved in the Mumbai attacks, the one survivor is a Pakistani citizen. It denies any of its state agencies were involved. President-elect Barack Obama‘s incoming administration plans to increase the focus on the battle against al-Qaida and Taliban militants operating along the Pakistan-Afghan border. American officials worry that a conflict with India could distract Pakistan from eliminating militant sanctuaries along the Afghan frontier, and have urged India and Pakistan to cooperate. Vice President-elect Biden was the latest in a string of envoys to visit Pakistan…. U.S. Vice President-elect Joe Biden assured Pakistani president Zardari Friday that the incoming Obama administration will continue to support Pakistan’s efforts to strengthen democracy and combat terrorism, according to Pakistan’s Ministry of Foreign Affairs. Biden told Zardari the new U.S. administration would also help Pakistan “meet its socio-economic requirements and capacity building,” the ministry said in a written statement. The vice president-elect “assured the Pakistani leadership” of the United States’ “continued assistance to Pakistan,” the statement said. You are currently browsing the archives for the Mumbai category.